It’s a perennial favourite with adults and kids alike. And it’s potentially deadly. Should manufacturers act? The villain: the good ol’ hotdog. The hot dog may be a saviour for time-pressed parents and a favourite among picky eaters, but a respected health body says it can also be a serious danger to children. The American Academy of Pediatrics identified the hot dog as the greatest food-related choking hazard to children in a policy statement released yesterday. So, should hotdog manufacturers act, to reduce the risk to kids? I’m sure for many people, the immediate response will be a skeptical one. There are lots of ways to die, and indeed lots of things that kids can choke on. You can’t prevent all accidents, and you can’t make products 100% safe. Leave the hotdog-makers alone! I’ve got a lot of sympathy for such views. But there are at least a few factors that make me think it’s at least plausible that hotdog manufacturers have an obligation, here. 1) Hotdogs aren’t just a choking hazard. They’re choking hazard #1. Sure, every product brings dangers. You can choke on literally anything you can fit into your mouth, whether solid or mush or liquid. But when one product dominates the top of the choking-hazard list, it’s hard not to think that manufacturers of that product should pay attention. 3) This is an area where no company could reasonably rely on government regulation, because specifying a regulation for non-choke foods is essentially impossible. First, it’s hard to imagine what the regulation would look like…a ban on food products of a particular diameter? That seems unlikely. Second, the worry here is about kids, but most food isn’t sold as “food for kids” — it’s just sold as “food.” And it seems a bit intrusive for government to ban a certain kind of food altogether, including for consumption by fully aware and rational adults. Yeah, yeah, I know. It’s just a hotdog. What could be more common and more innocent than the beloved hotdog? But we shouldn’t let the cultural centrality of a food (or other product) seduce us into exceptionalism. So, if you think the manufacturers of the highest-choking-risk food have no responsibility to improve their product, do you also think that goes for other products that are most-dangerous in their respective categories? « Was Polluting Factory a “Gap Factory” and Does it Matter? This seems like an opportunity for profitable ethics. If a company redesigned the hot dog and then marketed it as “kid safe”, one would think that there might be a market for that. I know that you framed the question as a potential obligation rather than an opportunity, but it was just a thought I had. I also happen to think that manufacturers have an ethical obligation to make safe products as well. But then I’d likely have to write a blog entry asking whether that company should be accused of scare-mongering, given how few kids actually choke on regular hotdogs. The actual stats are that about 4 American kids die each year from choking on a hotdog (about 17% of the 20 choking deaths that happen each year). So the absolute danger from hotdogs is small, though the relative danger (compared to other foods) is high. They could put a long thin hole through the center of the dog to allow breathing even if it gets wedged in a child’s throat – like a lifesaver mint. Problem solved – when can I collect my fee? Speaking of products that are most dangerous in their categories, isn’t “most dangerous” meaningless without the qualifying proportions and scale? It’s like worrying about highest point on a map when trying to get from point A to point B regardless of its relationship to either of these salient points. I understand that hotdogs are dangerous because their size is near-identical to the wind-pipe. However, instead of making the world a safer place by eliminating dangers, wouldn’t it be better to educate parents about the dangers, and maybe why they shouldn’t let their child bounce around while eating the hotdog?? If they start with the hotdog, it will just continue in a down-ward spiral. The world is not meant to be child-friendly. Children need supervision! But still — playing devil’s advocate, here — the hot dog makers are killing kids, more kids than any other segment of the food industry. “Worst” does seem at least a little morally relevant, here. At least it seems to imply a “prima facie” obligation for those companies to look at what they’re doing, and at least *ask* if they could change anything that would make their product safer. Of course, your plan involves reducing dangers too — you just prefer to put responsibility for doing so on parents, rather than industry. I don’t necessarily disagree. But public education is hard, and it might — might! — be easier to get industry to make a small change in its manufacturing procedures than it is to educate millions of parents. My stand actually comes from a friend of mine, who choked on a hotdog at the age of 12. It was lodged in his esophagus, not his trachea, and didn’t cause him respiratory issues. And fortunately, with medical assistance, he threw it up on his way to surgery to have it removed. Never saw the hotdog, but apparently it was about 1/3 of a hotdog that he had attempted to swallow. He was also jumping over a couch at the time, trying to get away from a friend. If he was sitting while eating, it probably wouldn’t have happened at all. Although, a point for the contrary, hotdogs are often used at kid parties where kids tend to be excited and bouncing around. I do believe that many people do not think of them as a danger. The one health professional I’ve spoken to about this (though not an expert on hot dog choking per se) is pretty sure no rambunctious behaviour is required in order for a kid to choke. It can happen quite easily. Parental control is not necessarily the key variable. I do agree that rambunctious behaviour is not a predictor of choking. However, I am guessing, logically, that the statistics may not be as high if you factored in unfavourable behaviour at the time of choking. I do think though if you changed hotdogs, parents would just start complaining about the shape of grapes! Or Candy! Or the consistency of bubble gum! Sometimes, you can never win. True: There will *always* be a “most dangerous” food. But do note that it’s not parents complaining, here: it’s pediatricians! I think there’s joint responsibility here – parents to explain to their children why food should be chewed properly and why bouncing around at mealtimes is not a good idea, and manufacturers to make reasonable adjustments to their products to reduce risk. That said, what is the safe size for a hotdog, when children do vary in size quite a bit ! My youngest would choke on something that my eldest wouldn’t do. And then again, some children might enjoy have a tube through their hotdog – the whistling hotdog could be a best seller ! And isn’t the greater risk a health one ? This notion seems counterintuitive to me. After all, if my product killed 3 kids a year I would not be inclined to think that killing the 2nd most kids absolved me morally in any significant way. When we are referring to statistics, does one less life taken by your product factor into morality more than any other considerations such as intent, foresight, doing/allowing, and so on? (Granted, not all of these distinctions are as relevant under considerations of business ethics as they are in normative ethics). This debate may boil down to two basic positions. Those who believe it is the corporations responsibility to act morally even if the actions of other companies tempt you to remain competitive at the cost of your ethics. (i.e., try not to choke 3 customers a year with your product even though the other guy is choking 4)Or those who believe that companies cannot be trusted to act ethically while also remaining competitive/efficient. If you hold the latter position, as I do, you may suggest that the government regulate hot dog packages so they warn consumers about the choking hazard. This way consumers can make an informed choice next time they have a bbq. No, I don’t think there’s a categorical difference between being #1 instead of #2 in the “most dangerous” category. But it seems to me (generally) that if YOUR product is #1, and if it’s #1 by quite a lot, then you don’t have the luxury of just shrugging your shoulders. It’s at least a sign that you ought to look at why your product is SO much more dangerous than others, and whether there’s something you can/should do about it. I would agree with your comment above, although I think all businesses have at least some kind of responsibility to understand why their product is harmful and what they can do to minimize that harm. However, the view stated above seems to me to bring about some difficulties–particularly concerning classification. How is one to categorize their product when concerned about harm, and is it always necessary, given a certain classification, that the company has a duty to understand and minimize that harm? 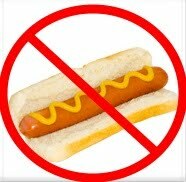 If I owned a hot dog company, do I have a duty to minimize the harm of my hot dog simply because my food is #1 in terms of harm with respect to foods in general (or perhaps foods enjoyed by kids)? I would say yes. However, do I have a responsibility to be the least dangerous food in the category of hot dogs? I would say that doing so may be an attractive selling point, but by no means am I obligated to minimize my harm relative to other hot dogs. Perhaps therein lies the problem. If I have no responsibility to minimize harm when I am roughly equal within a very narrowly defined category (“hot dogs”, rather than the broad category of “food”), then how does that translate into a duty to minimize the harm of hot dog products within the broad category of food? Furthermore, how is that duty spread amongst many companies in a way such that no company loses the competitive edge by taking the moral high ground, and every company is entitled to remain roughly equal in terms of harm within the narrowly defined category? The more and more I think about this question, the more my intuitions tell me this is the exact kind of problem addressed by government regulation. However, as I said before, it just seems silly to expect the government to exert this kind of control. Such fierce diligence seems best left to the consumer.